At Noble Mountain our mission is to grow trees with exceptional quality for our customers and provide the highest possible customer service in the industry. We strive for honesty, integrity and customer satisfaction with every transaction, large or small. Our goal is to be stewards of the land and continue to grow trees while benefiting the environment. 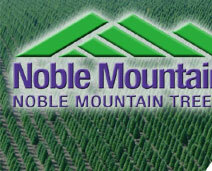 Since 1976, Noble Mountain has been one of the world's largest wholesale Christmas tree suppliers of Plantation Noble Fir, Douglas Fir, Scotch Pine and Grand Fir. Over the years the market has continually changed which has given us the opportunity to now also grow and offer several other varieties of trees such as Nordmann Fir. Our combined farms total over 4,000 acres and along with our headquarters are strategically located on the edge of, and within, Oregon's famed and fertile Willamette Valley. Noble Mountain Tree Farm is in a region foresters say is one of the finest natural tree growing areas in the world. Here, where winters are crisp and moist, and summers are sunny and mild, Noble, Grand and Douglas Fir trees flourish. Nurtured by experienced hands, they are brought to perfection in late fall and helicopter-harvested mere hours before shipment to meet the growing American demand for natural trees at Christmas. Thanks to technology and years of experience we have the ability to service large and small customers alike. Our highly skilled staff and sales people can help meet your every need whether it’s a single mixed species load of 250 trees or an order of 100,000 or more with multiple drops and mixed species. Our sales data over the years has helped us develop some of the best sell through percentages in the industry for our customers. Direct ship to store or lots in truckload or less then a truckload quantities. Drop shipment throughout the selling season on larger orders to help our customers with their cash flow and to maintain freshness. Mix loads of Noble, Douglas, Grand Fir, and other species to help meet the diversified needs of the consumer. 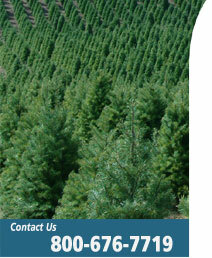 To assure November/December availability of trees, tentative orders should be placed by the previous June. The buyer's schedule of delivery dates should be set in late September and no later than October 15. 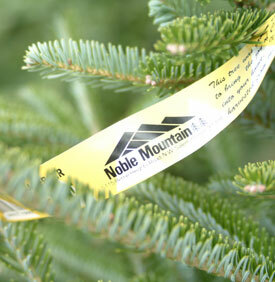 Tree price lists are available by calling Noble Mountain at 800-676-7719. We have operators taking calls on a 24-hour basis during the buying and harvesting season and your call is welcome at anytime. Over the years Noble Mountain Tree Farm has developed a reputation for consistent high quality, prompt delivery, and competitive prices. The combination of ownership and management experience totals more than 150 years. That is a fact which figures in our ability to deliver a fresh, highly profitable product to our customers. We sincerely believe we offer the buyer more than other major growers and stand ready at anytime to respond to your questions. We have been and will continue to be a leader in the production and delivery of legendary quality trees to satisfied customers. Close to 34 years ago, the Christmas Tree growers in the Northwest had a very good reason to be concerned – the possibility of a flooded tree market was very real. In the hills near Salem, OR, Crown Zellerbach Company had been quietly growing noble fir Christmas Trees on over 1,000 acres. Up to this time, the industry was primarily made up of family businesses and small landowners growing trees on dozens of small tree farms. 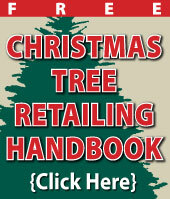 Crown Zellerbach was the first large corporation to enter the Northwest Christmas Tree market. However, as a result of early mass plantings, Crown had an enormous amount of trees that were going to become marketable all at once. 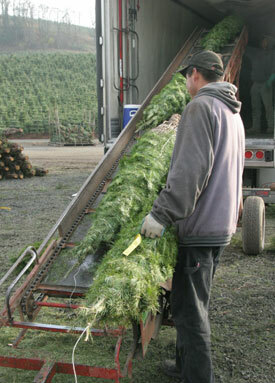 Crown had hired Paul Goodmonson, a recently retired partner of Holiday Tree Farms in Corvallis, Oregon as a consultant. Due to the fact that Crown had not developed a market for the trees, they were advised to sell the entire farm. At that time, their farm consisted of 1,117 acres with over one million noble firs coming to market over the next two-year period. When my husband, Bob Stohr, and I got the call about the pending sale, we were definitely interested. However, we knew that our company, Douglas Fir Christmas Tree Company, and we could not handle such a large purchase alone. But Bob didn’t give up and he decided to put together a group of potential buyers. He turned to three skilled Christmas Tree men to join him in the purchase. His first agenda was to convince Paul Goodmonson that he was too young to retire and still very much needed in the industry. Paul had previously served as the President of the Pacific Northwest Christmas Tree Association, as had Bob. Paul later served as the President of the National Christmas Tree Association. Bob also served as a trustee for the National from the Pacific Northwest. Second, Bob asked Gary Bishop from Ken Del Ranch in Northern California to join the group. Bob had dealt with Gary and his father, Ken Bishop, for some time in Los Angeles. Ken Del had wholesaled large numbers of trees in the LA area for many years. Third, Bob invited Fred Peste, at that time his partner in Douglas Fir Christmas Tree Company in Shelton, Washington, to participate in the venture. Many Northwest growers will remember Fred as a pioneer in the industry and subsequently a recipient of the Herb Plum Award. Negotiations Held "Between the Boxes"
Negotiations with Crown Zellerbach began. It was an exciting time for all of us. Bob and I had just purchased on old house on American Lake, just out of Tacoma Washington. It was in need of much work. Even in the midst of all the remodeling, it seemed as if our meetings with our potential partners and Crown representatives always ended up at our house. We were pretty much living out of boxes at the time. Consequently, on the day of the signing, the Crown executives and the four new owners toasted champagne to each other in plastic slurpy cups! We joked about that for many years. So, it was four families, all experienced tree people that became the new owners. A fifth partner, LA investor, came in later. The year was 1976 when Crown Zellerbach’s farm became the new Noble Mountain Tree Farm. Bob had great concern about the large number of trees coming to market from the Crown farm and their potential impact on the industry. Fortunately, Douglas Fir Christmas Tree Company was selling much more than it was producing and that was helpful in moving many of the newly available noble fir trees. Bob was determined that the trees were to be spread over a wide geographic area to avoid flooding the traditional Northwest markets. Together, Bob and Gary Bishop spent a great deal of time searching and charting new avenues of sales across the United States. They targeted the East Coast. This proved to be a real challenge because, while Northwesterners believed noble to be our most desirable species, it was unheard of back east. It took real salesmanship, but Noble Mountain became the first Northwest company to develop a market for this species in such far away markets. Incidentally, they were successful enough in their sales efforts that the western markets were not “flooded” with noble fir trees. Gary Elder, farm foreman, Greg Johnson, shop foreman, and Bob Schaefer have become key members of the organization. Bob was selected to become the general manager. We are grateful to have retained these original staff members for so many years.